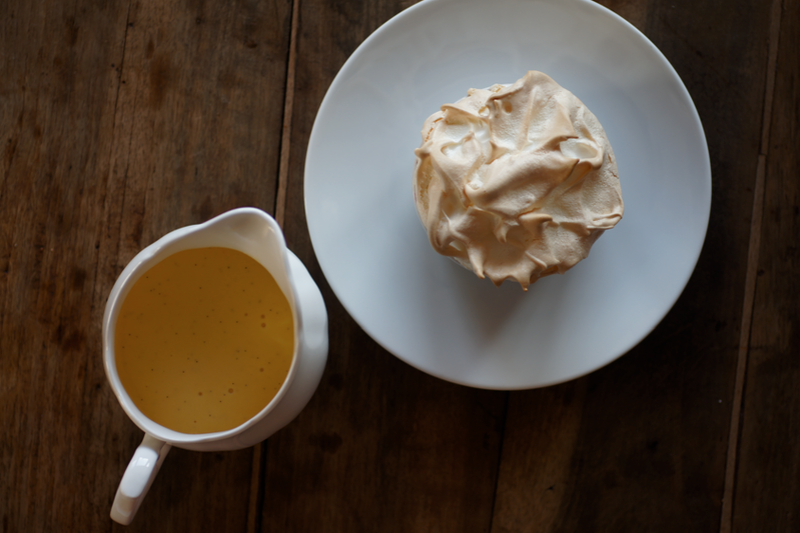 When I was younger one of my favourite desserts was my mum's apple meringue with custard. To make it we would walk through our orchard to the best cooking apple tree and pick up a few of the giant green apples. On the way back to the house we would stop at the chicken houses and pick up fresh eggs for the meringue and custard. Then the apples would be peeled and lightly stewed with some lemon peel before being topped with the meringue and placed in the Aga. The custard was made with the leftover yolks. We don't live at that house any more but the memories stay with me. This is my new version, though the apple stays close to my heart. 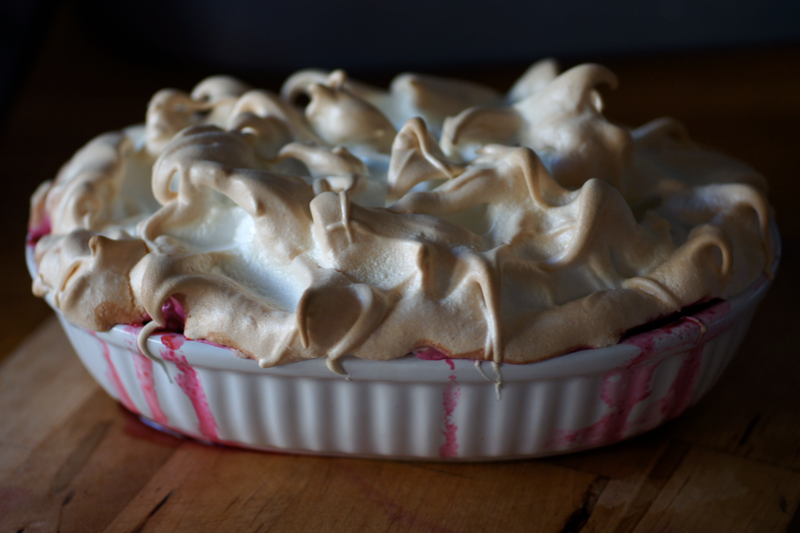 You can change up the filling however you like - though it's important that it's on the tart side as the meringue is sweet (hence cooking apples, sharp berries). 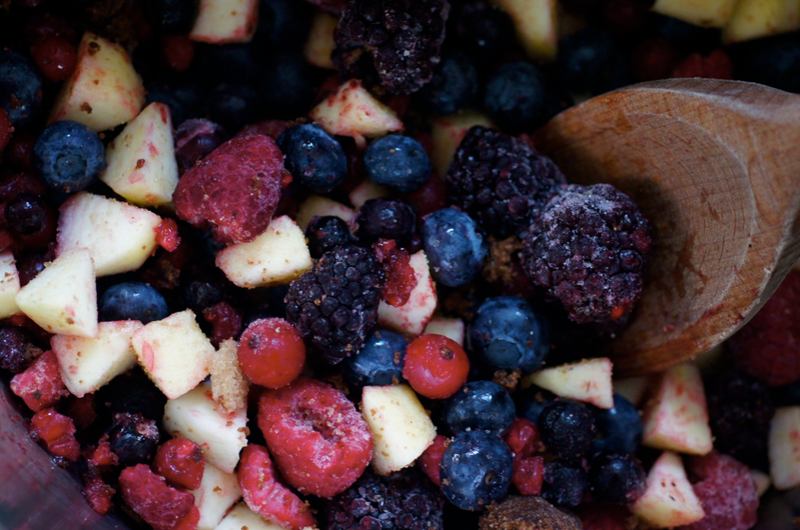 I like the frozen berry mixes you can get in the supermarket - they're so quick and great in winter when you want a change. We usually make it in one big dish but I decided to try a smaller one. Turns out that it's pretty pointless as the whole point is that you have lots of custard and there's no space for it in a ramekin. So I transferred it to a big teacup and ate it that way. 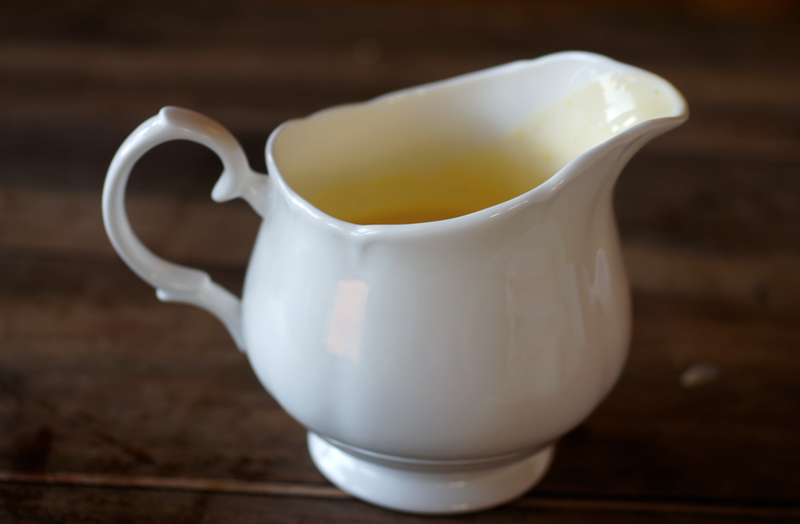 My mum always used to make custard with milk, vanilla, cornflour, a small amount of sugar and a few egg yolks. The version below is much richer and only thickened with yolks. I like both but this recipe is great for a special pudding. Pour the milk into a pan and bring to the boil. Meanwhile whisk the vanilla, yolks and sugar together. Pour the milk into the yolks, whisking constantly. Return to the pan and put back over the heat. Stir constantly until the custard thickens and coats the back of the spoon. Take off the heat and sieve into a bowl. Whisk in the cream. Place a layer of cling film over the surface and leave to chill until needed. You can heat gently if you prefer warm custard. Peel then chop the apple up into small chunks. Place with the berries, sugar and juice in a saucepan and warm through until the sugar is dissolved. Pour into a baking dish. This can be done several hours before you want to serve. Preheat the oven to 160C. Whip the egg whites until they hold medium peaks then add the sugar slowly. Whisk until glossy and stiff. Dollop around the edge of the baking dish and then fill the middle. Make sure the meringue touches the edges. Spike up all over. Place into the oven for 35-40 minutes or until golden and crisp (I slightly undercooked the bigger one above so don't go on that picture). Leave to settle for 10 minutes then serve either warm or cold. OMG! This is genius! 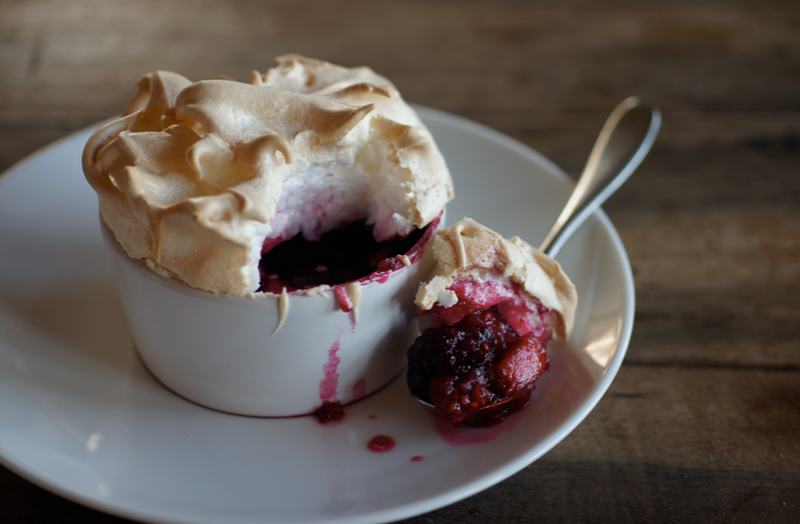 Like a crumble or a cobbler but with meringue on top. I have got to try this ASAP. I love this. 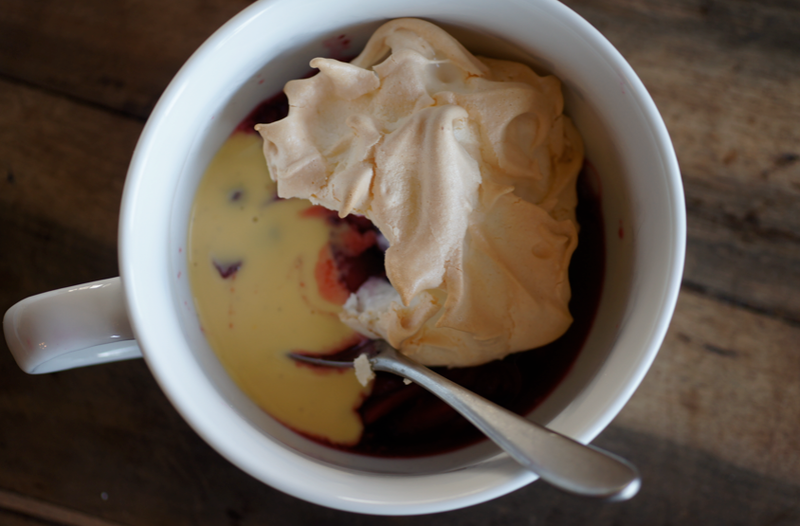 I was thinking of a pre-baked crumble over the berries and beaneath the meringue, just to add more to my body fat lol Your sweets are just phenomenal. That looks absolutely divine, OH.. 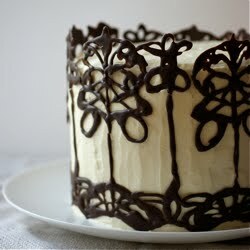 I'm dreaming of making this, the berries, lush, I'm quite smitten over this. loved being here, reminds me of me! simple, uncluttered and nice! Ohh yum! This is one gorgeous dessert! I can't wait to try it out soon! What beautiful memories! This sounds like a quick and easy dessert, almost pie-like, without having to make pie-crust. It's awesome. wow!! What is better for it? Tea or coffee?